Whether you’re looking to make a bold statement in your home or simply tie a room together, area rugs can help you achieve your décor dreams. Rugs serve a multitude of purposes and are readily available in every size, shape, style and price point imaginable. The only difficult part is deciding which one is right for your space. 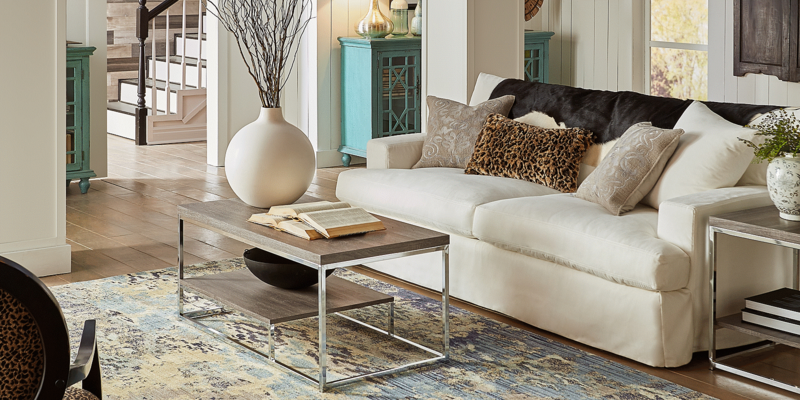 Before you decide on the details, designate the general purpose your rug will serve in the room. Are you looking for a rug to fit under a dining table? To set off a cozy reading nook? To tie together a seating arrangement? Or even to cover a majority of the room? 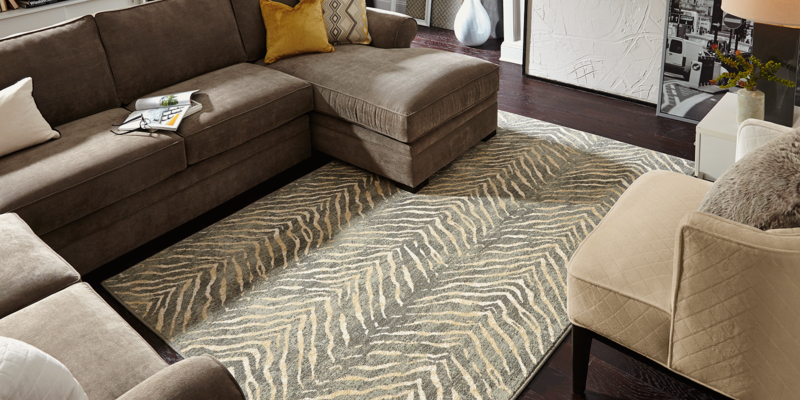 Once you’ve found the purpose for your area rug, think about how it will relate from a style standpoint. Do you want to inject vibrant color or soften the room? Are you looking for energy from distinct patterns or a more subtle texture? Will the rug need to coordinate with adjoining rooms? Understanding the role you want your rug to play will help simplify the process and make the details easier to sort through. There are no hard and fast rules when it comes to choosing the size of an area rug, but there are some general recommendations to rely on if you’re not certain of what you need. Look at the furniture in your room. Under a dining table, for example, a rug is usually large enough for the chair legs to remain on the rug if someone is seated. Adding 36” to 48” to the length and to the width of your table will give you a minimum measurement for your rug. Designers often use round rugs under round or square tables and rectangular rugs under oblong or rectangular tables. For seating groups, many designers recommend putting at least the front legs of each piece of furniture on the rug to help tie the grouping together. In a larger room, where the furniture is pulled away from the walls, some designers prefer for the entire grouping to sit on top of the rug. Measuring with these tips in mind will help guide you to an appropriate size. Bedrooms will take more consideration. Large beds can often cover up a rug, so it’s best to add four feet to the width of your bed and two or more feet to the length to allow for cushioned walking on all three sides. Designers sometimes run the rug all the way under the headboard, so side tables line the rug. Other times they run the rug under only the bottom two-thirds of the bed, so the side tables sit on the floor. Another option is to lay three smaller rugs of equal size around the perimeter of the bed. It is also common practice to place a smaller rug at the foot of the bed with only the footboard overlapping the rug. You may want your rug to fill the majority of your room, and in this case, designers recommend leaving at least 12” of space between the edge of the rug and the baseboards as a border. Karastan rugs are available in most standard lengths and widths, but if you have a unique-sized space, Karastan carpet can be cut and bound into a custom sized area rug that perfectly fits your home. While round and rectangular are the most common shapes, you can find many others if you’re looking for something less expected. Again, there are no hard and fast rules, so if you want to put a round rug in a rectangular space to soften the edges, feel free. Rugs come in all colors of the rainbow and a vast array of patterns. Some designers start with a beautiful area rug and build a room’s decor around it, pulling colors and pattern motifs for walls, furniture and draperies from the rug as an inspiration piece. This method makes choosing a rug simple; pick the one that you like best and go from there. If you already have other decor elements in place, however, you’ll want to fit the rug to the room. For a room full of color, find a rug that reflects some or all of those same colors, without introducing new ones, to help unify the space. In a neutral-colored room, a vibrant rug can inject much needed energy. Neutral colors can soften a space, while dark colors can ground a room by providing depth. Patterns can be bold or subtle, large or small. If you don’t have much pattern in your room, it’s easier to play with pattern in a rug, however, if you already have a variety of patterns from wallpaper, drapes, pillows and furniture, you may want to opt for a solid or tone on tone rug. When mixing patterns, many designers recommend altering the size of the patterns. So, if you have a large pattern on the drapes and a medium pattern on the furniture, you would want a smaller pattern for the rug. However if you have a small pattern in the drapery, you could go for a large pattern on the rug. Don’t be afraid to experiment with different looks. Layer rugs of different sizes for more interest, put a rug on the diagonal rather than at right angles to the room. Place a round rug in the rectangular “L” of a seating arrangement for the unexpected. Try putting a transitional rug in a traditional space or a traditional rug in an otherwise modern room. You’ll enjoy seeing how different placements change the look and feel of your home. Area rugs offer a fun way to freshen up a room, and can completely remake a space. Are you ready to choose the perfect option for your home? Come visit our store, and let us walk you through our product options.